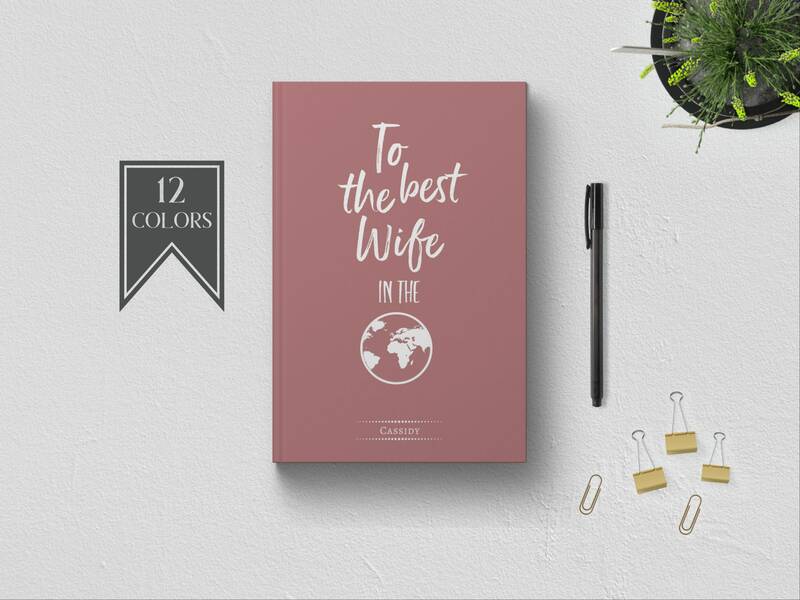 The perfect PERSONALIZED "To The Best Wife in the World" Blank Journal Notebook on the elegant cover with your choice of cover color! Customize the cover with your wife's name. Simply leave a note at check out with the name you would like on your journal cover. Surprise your wife with a thoughtful, personal and romantic gift from you. This blank notebook features the words "To The Best Wife in the World" on the cover and plenty of room for her to record all of her to write letters, thoughts, and ideas. "To The Best Wife in the World" Notebook Journal to write in, comes with your choice of interior pages, and makes the perfect romantic gift idea for an anniversary gift, birthday gift, Christmas gift, Valentine's Day, wedding gift, or any occasion to express your love and appreciation for your wife.